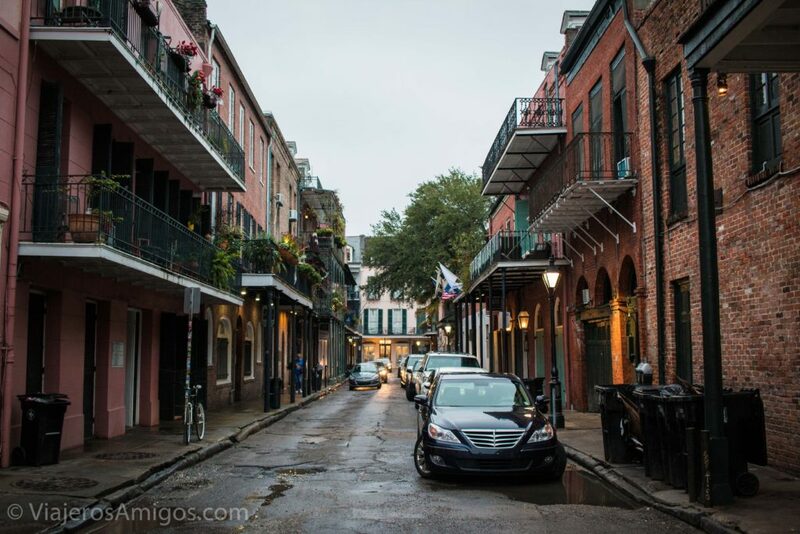 Visiting the French Quarter of New Orleans - Viajeros. Amigos. 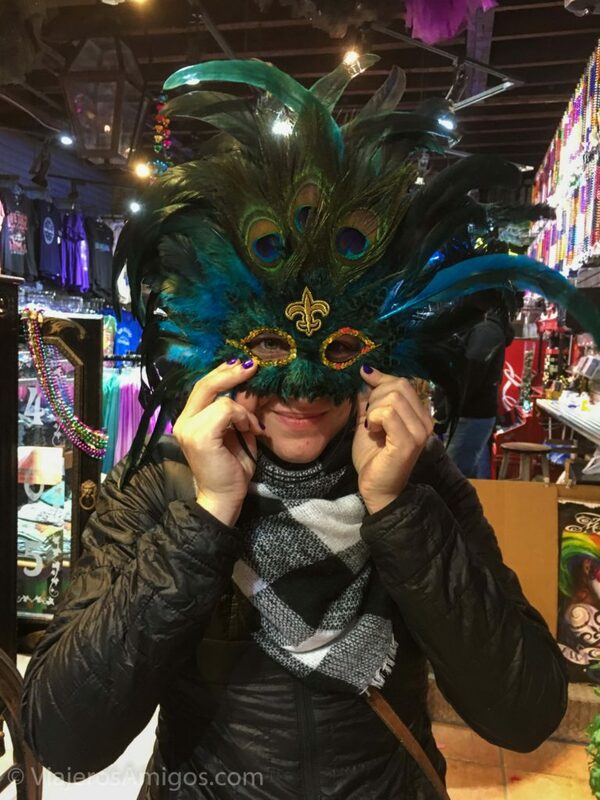 So we’ve wrapped up our posts about Cartagena, Colombia, but we have plenty to say about the second half of our trip: New Orleans. If you want to read about Colombia, click here. 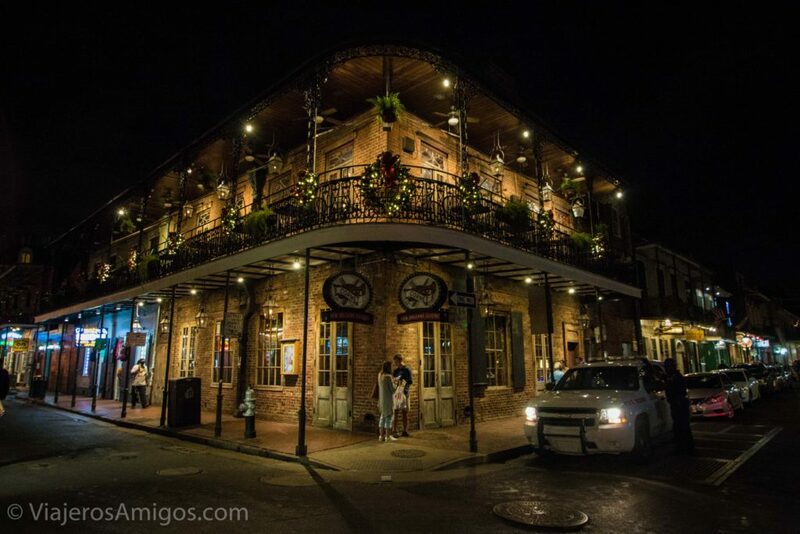 When people think of New Orleans, it’s a safe bet that the first image to come to their mind is Mardi Gras and the French Quarter. 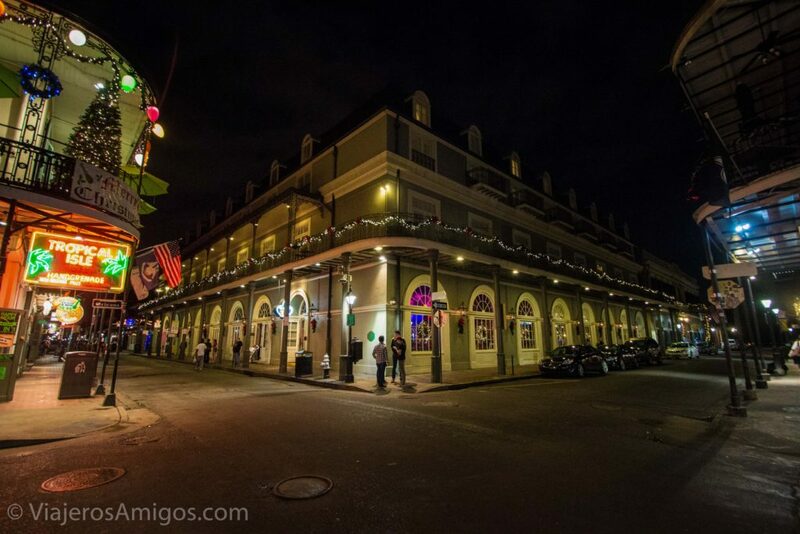 Everyone has heard about the celebrations: the beads, the parades, and so on. 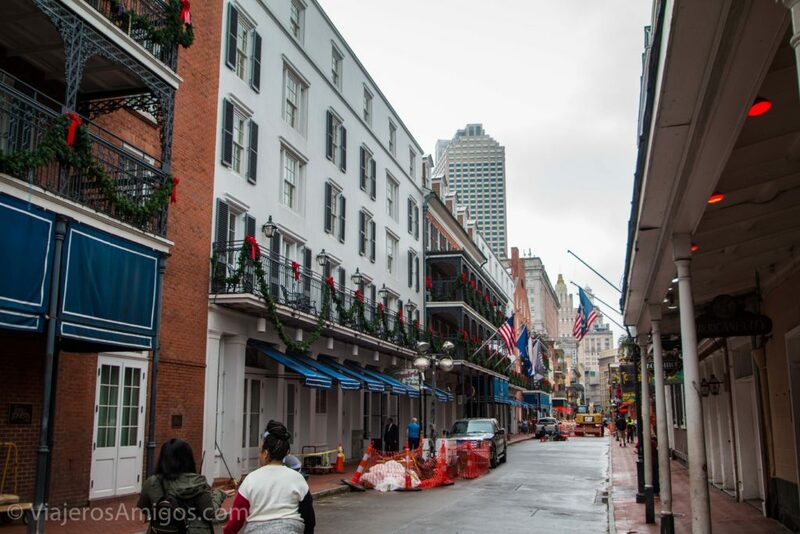 The French Quarter can still be fun during the off season though, as we found out! 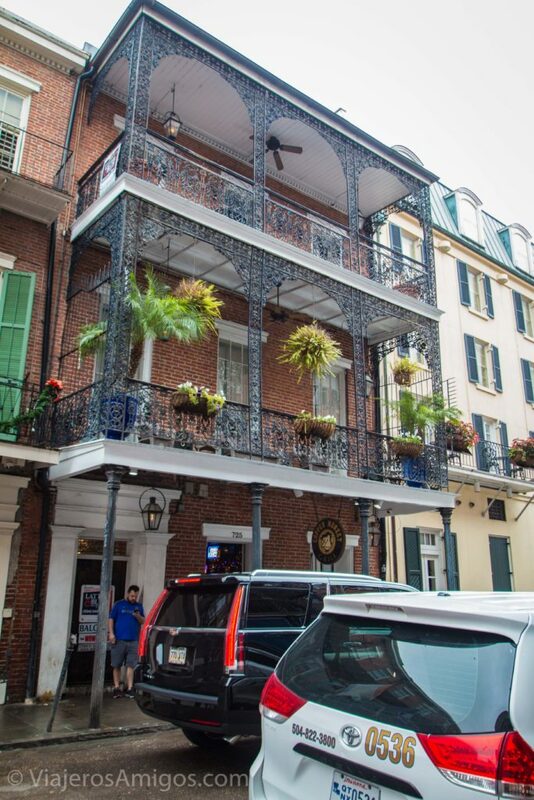 While it’s known as the French Quarter, most of the structures were actually built by the Spanish in the courtyard style. 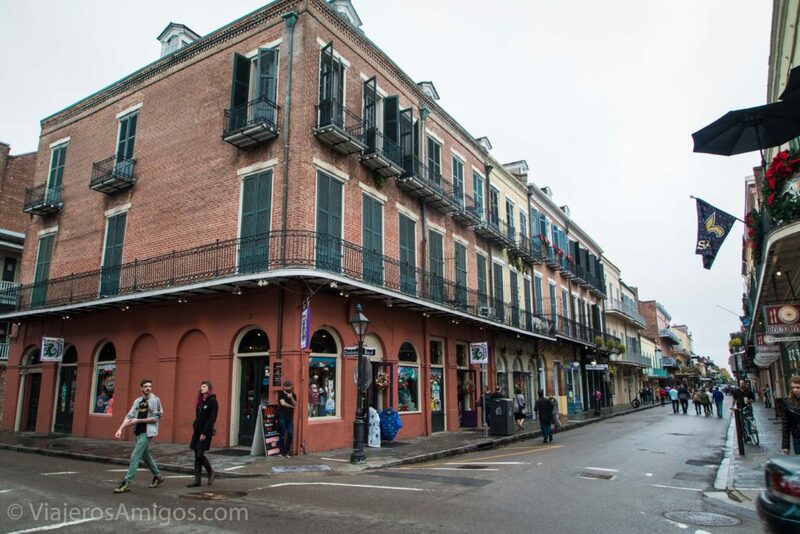 It is named the French Quarter because it was first settled by the French, but most of the original structures were burnt down by two large fires in the late 18th century. You’ll have a fun time walking around the neighborhood just taking in the sights and capturing some fun photos (a wide-angle lens is probably best for the buildings and a short, prime lens for portraits). 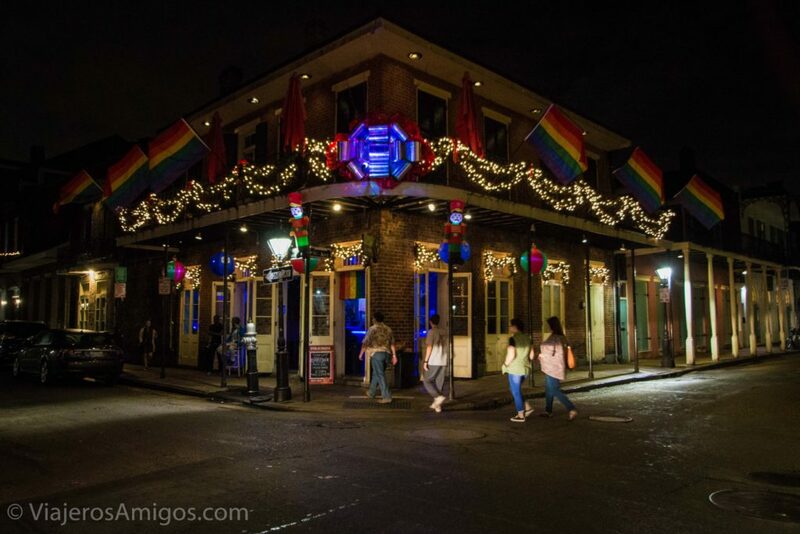 The main thoroughfare for Mardi Gras celebrations is the famous Bourbon Street. 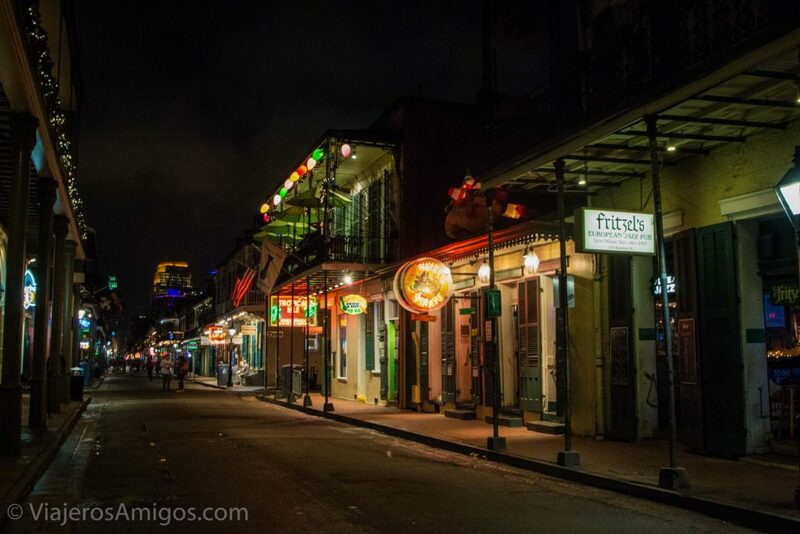 The street is packed with to-go pizza joints, strip clubs, bars, and daiquiri bars where you can order frozen alcoholic daiquiris (it is legally to drink openly on the streets in New Orleans). There are even closet-sized bars to order the local Hurricane drink to go. The drink comes in a fish bowl and tastes like Hawaiian Punch. 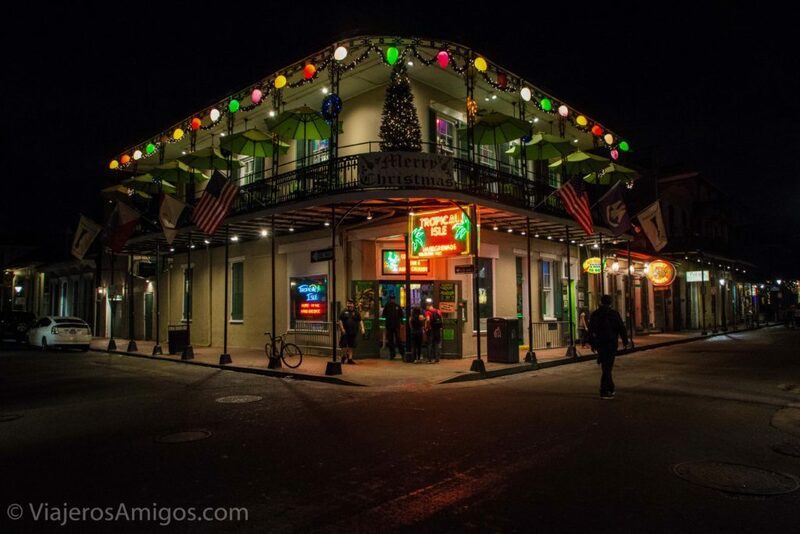 Unless you’re in college and coming down to party, visiting Bourbon Street for a couple hours one day is really all you need. 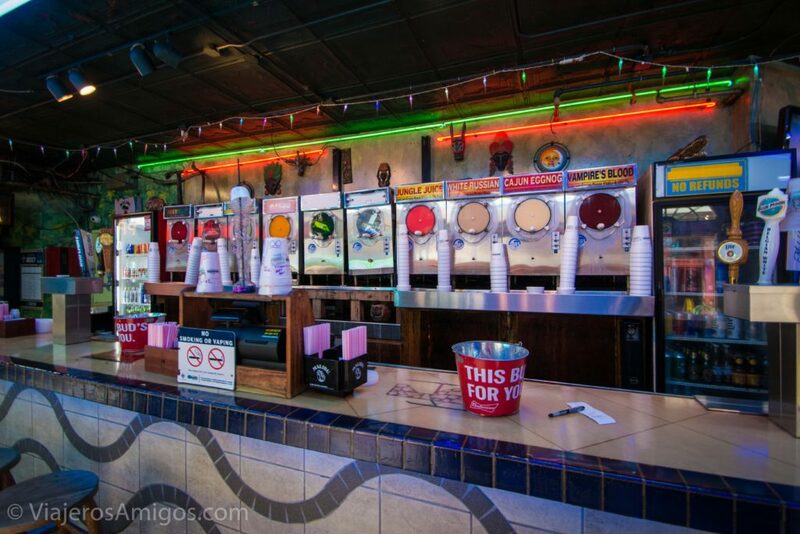 It is best enjoyed at night when all of the neon lights are aglow. 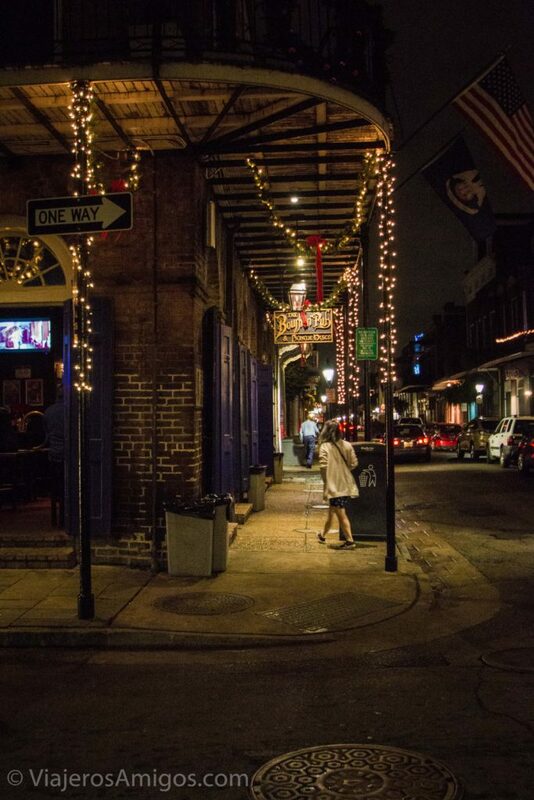 Parallel to Bourbon Street is an equally pretty street, but the businesses are suited for a different purpose. 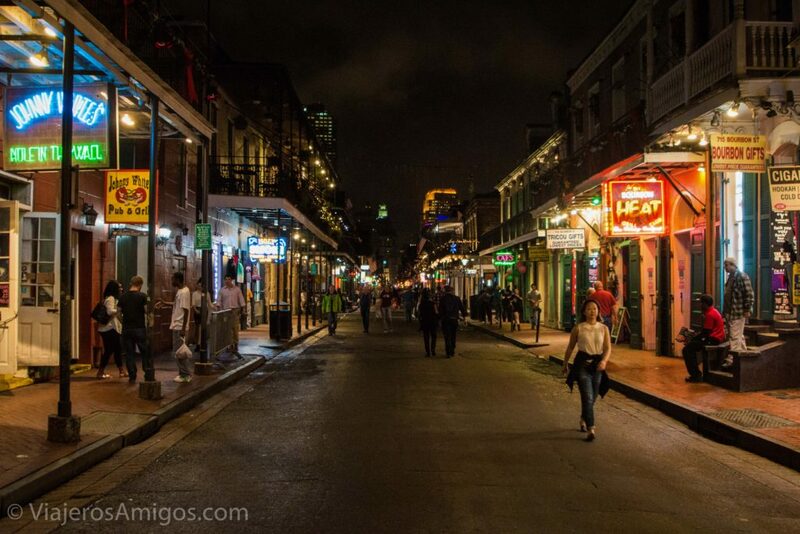 This is where you’ll find many shops, and some fine dining restaurants. 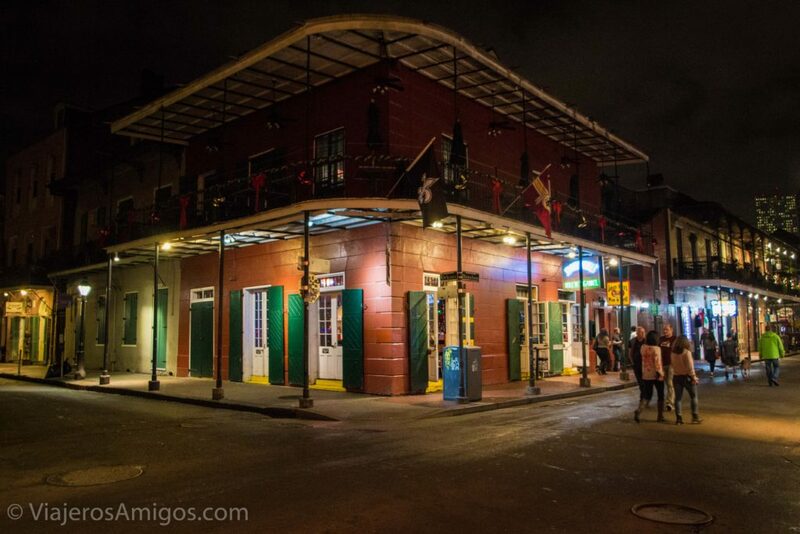 It’s easy to find as it’s just one block East of Bourbon Street. 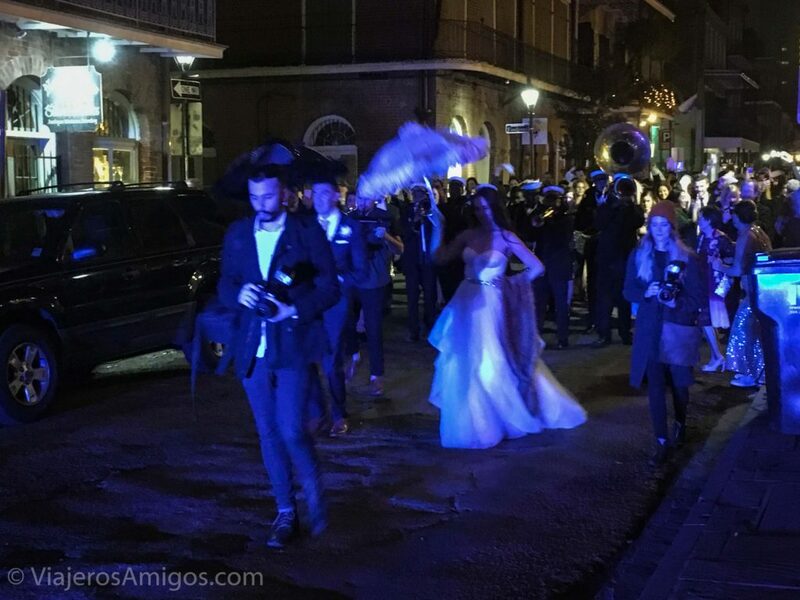 On our first night in New Orleans we happened across two different weddings marching down Royal Street in a Second Line (a sort of parade/marching band/party rolled into one). The bride and groom were up front dancing, followed by the wedding guests. It looked like a lot of fun! I don’t really know what to say about Jackson Square. It’s just a plaza. But it’s a nice plaza to see. Lots of people gather there: artists, performers, tourists, etc. 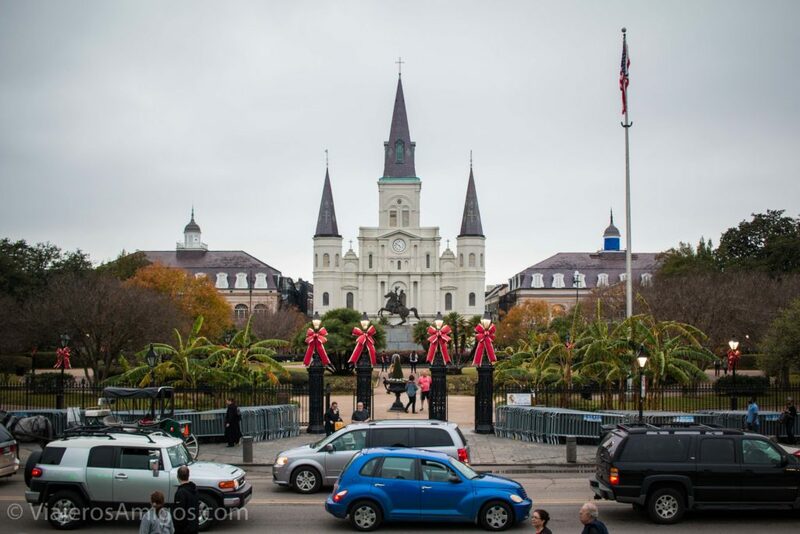 At one end is the unforgettable St. Louis Cathedral. I have no clue what style of architecture it is, but I haven’t seen others like it. 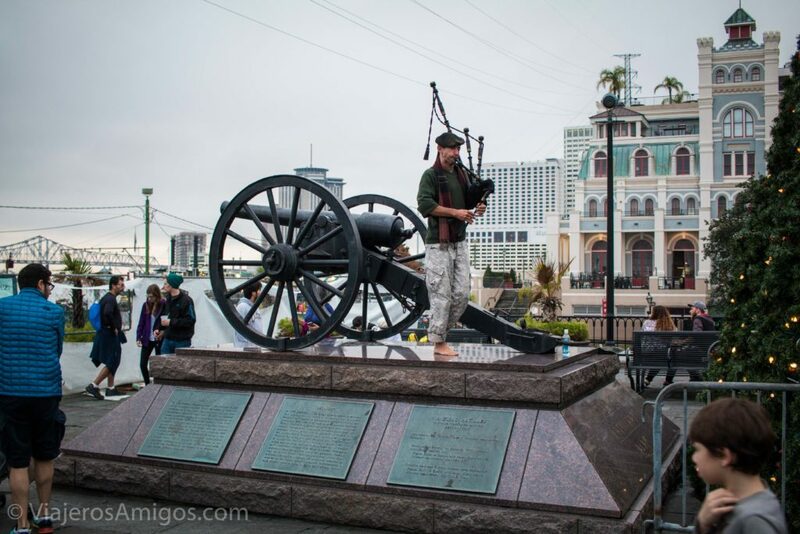 Some fellow decided to serenade the crowd with bagpipes. 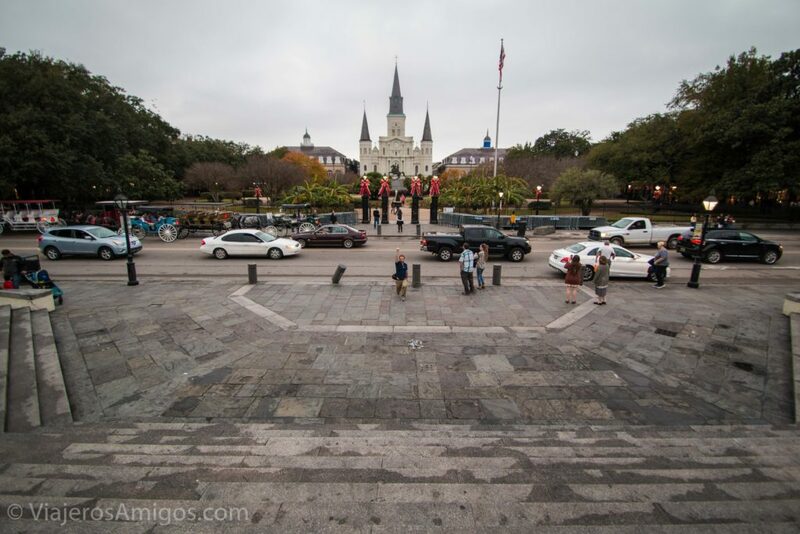 On the opposite end is a platform called Washington Artillery Park that overlooks the Mississippi River and provides a great view of Jackson Square. 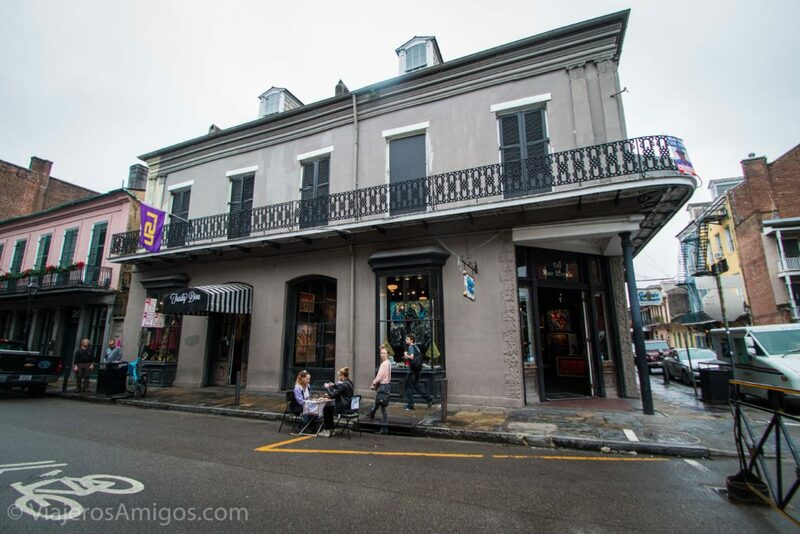 If you walk North of Jackson Square along Decatur Street, you’ll see lots of shops and bars, including a few different hot sauce stores that have hundreds of samples to try. If you like hot sauce, that’s a must. A little further along Decatur, you’ll pass Second Line Arts and Antiques. It is a very eclectic venue for different artists to display and sell their work in booths. It was a varied mix of styles and made for an interesting stroll. 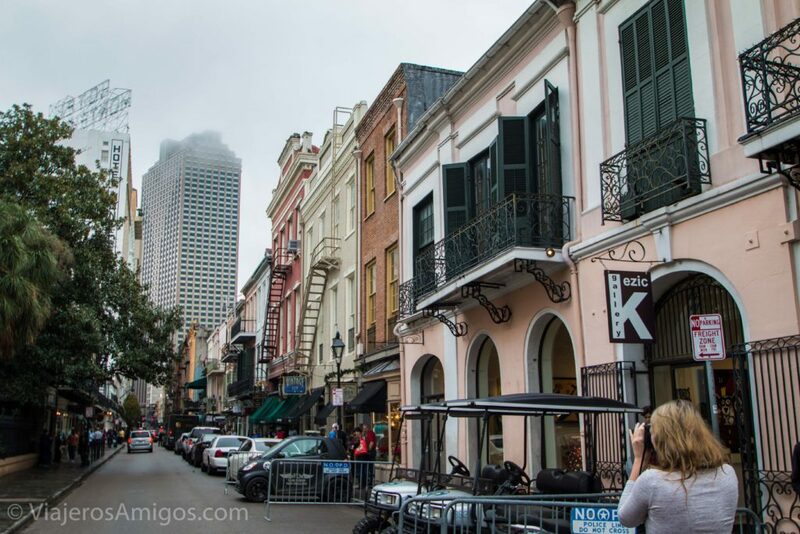 Just one block East of that on parallel French Market Place is the French Market. This wasn’t opened during the evening when we walked by it, but it’s basically a bunch of shops to peruse. 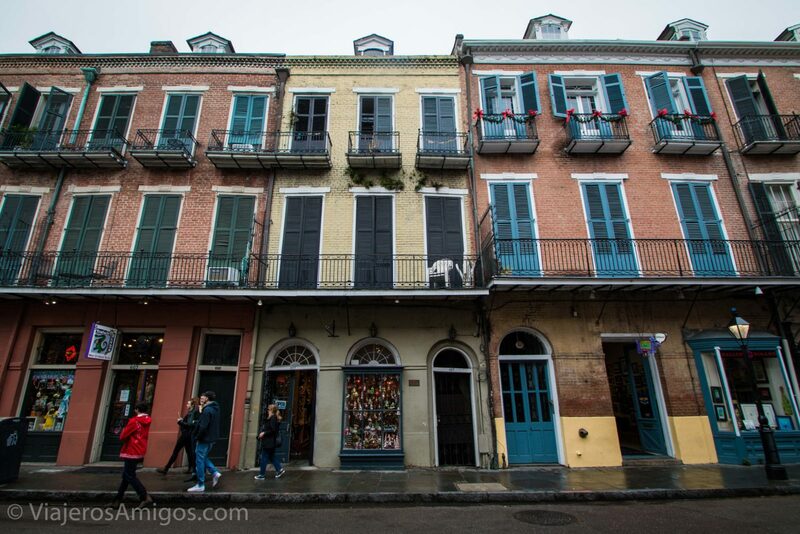 Finally, in between Bourbon and Royal Street, you’ll find the popular Preservation Hall. We will expand on that further in our next post. 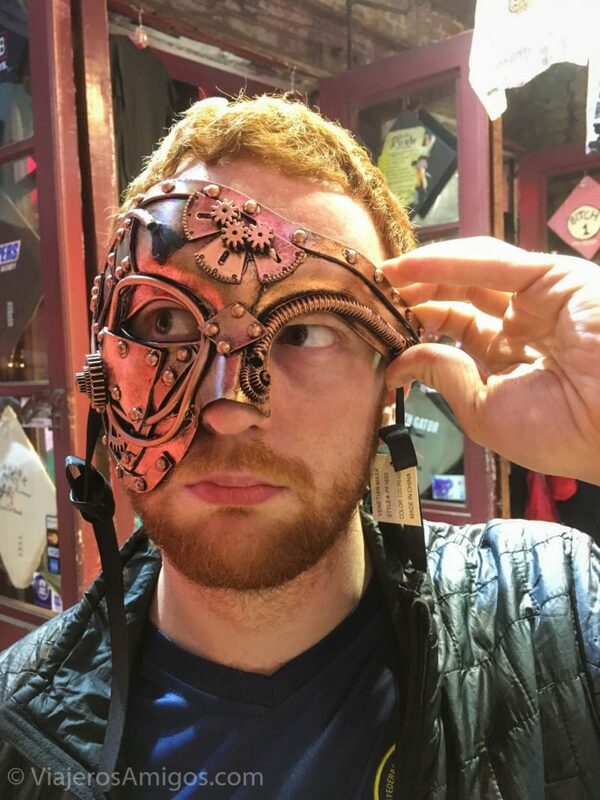 ← Should You Learn Another Language Before Travelling? 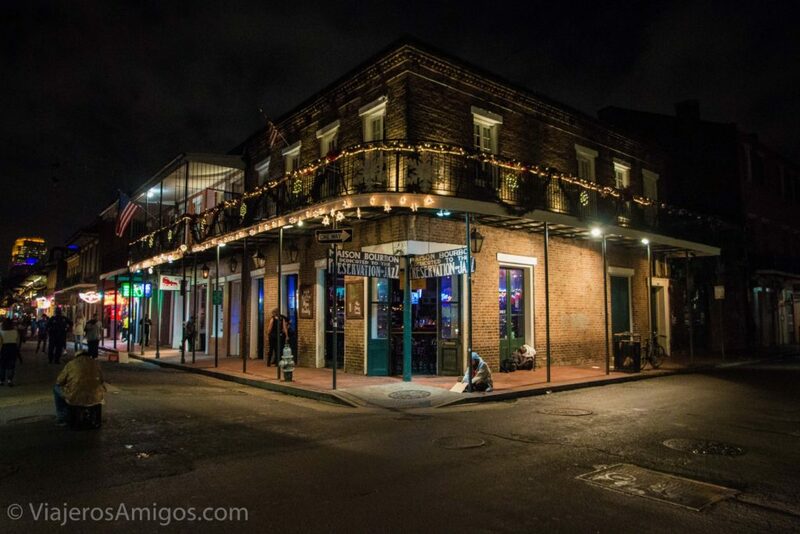 Pingback: Tap Your Toe at the Preservation Hall | Viajeros. Amigos. 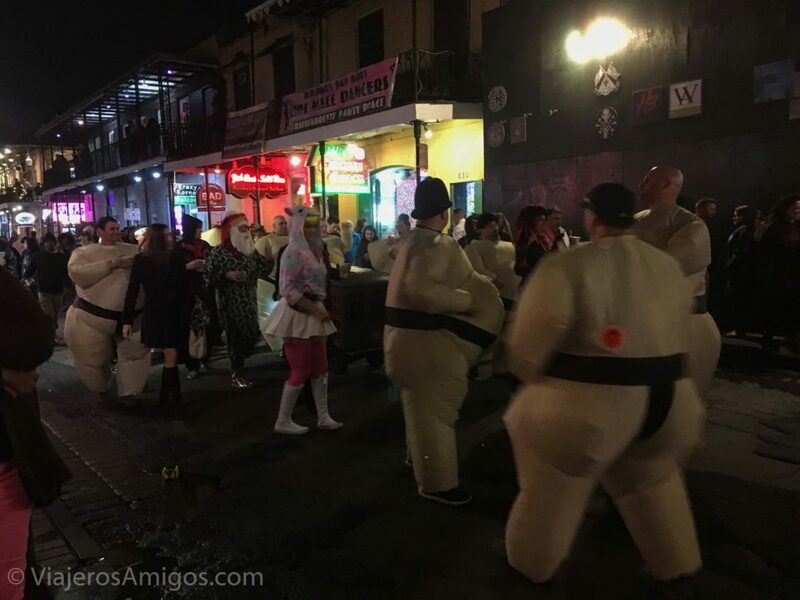 Pingback: 6 Things We Loved About New Orleans | Viajeros. Amigos. 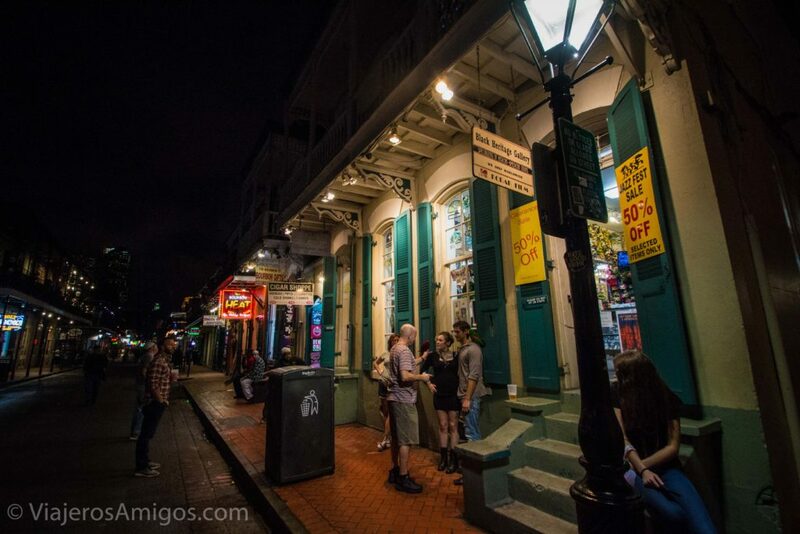 Pingback: Catch Some Music on Frenchmen Street | Viajeros. Amigos. 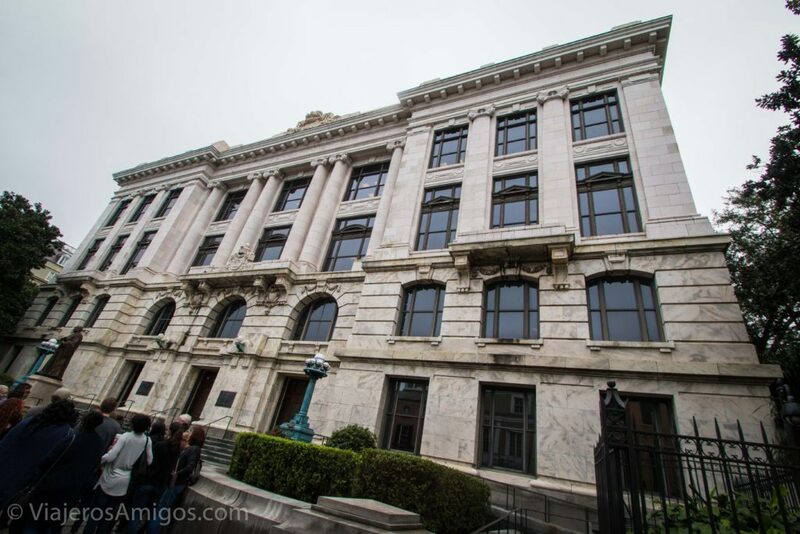 Pingback: Spend a Night in Mobile, Alabama | Viajeros. Amigos.